During their 45 minute performance, I took just under 100 shots, all free-hand in automatic mode. . I took full advantage of the long zoom for some (or tried to — at 810mm equivalent, it’s challenging to track planes across the sky), and for others I was better off cropping the 14.1MP original. The autofocus was often frustratingly slow for this subject, and too often distracted by uninteresting boat masts and sea birds. A particularly challenging first shoot, so I don’t really have an opinion yet on what I think of the camera (and whether it’s what I want to take it to the #NASATweetup at the end of the month), but here are three of my best shots from this initial test. Laura was kind enough to quickly run through them in Aperture to select the best ones, auto-leveled the colors, and cropped the first two. This entry was posted in cameras by Dale Larson. Bookmark the permalink. Thanks, Robert, glad you liked them! 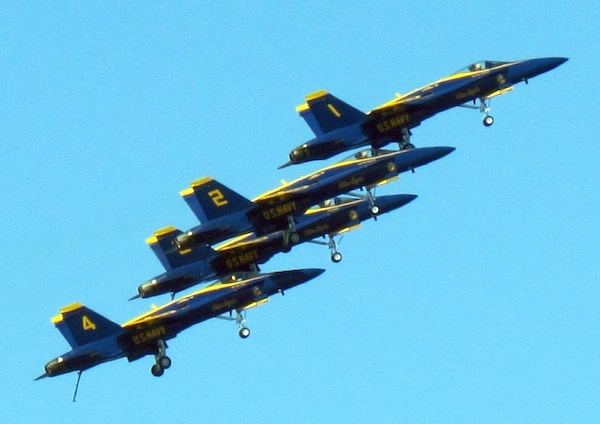 Hi Dale, I tried to photograph the Blue Angels this afternoon from our roof and didn’t do as well as you did yesterday at Fort Mason Marina. I basically got two acceptable shots out of 68 — although that’s really not bad because (1) I’m really picky (2) I’m very inexperienced with photographing subjects that move and (3) I’ve never used a Canon camera before. 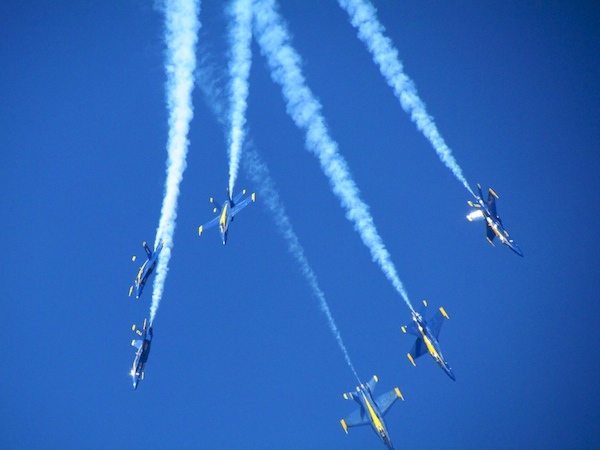 I did photograph the Blue Angels once before, with my Nikon D6000 DSLR. I had a LOT of focusing problems with it that the Canon seemed to not bother me with. One thing I don’t like about the Canon is that when you’re shooting through the viewfinder, it displays the shot you just took for a couple of seconds. I’m fine with it doing that on the screen, but when I’m tracking a fighter jet I just want the picture snapped and the viewfinder clear so I can keep following my subject. I wonder if there’s a setting for that…I’ll have to look in the owner’s manual. It was pretty easy and fun to work with the Canon SX30IS, but I’d like to use it some more under my “usual” conditions (travel photography of non-moving or slowly moving subjects) to decide how I really feel. The Canon made me miss my old Nikon DSLR — there’s something about that sleek “snick” of the shutter closing that makes me really “feel” like I’ve taken a picture. It also wasn’t as fast as my Leica D-Lux 4 — but then the Leica only has about a 2.5x optical zoom so it would have been useless today anyway. Thanks for letting me try it, and cheers to you for getting three really good pictures yesterday! I haven’t tried out the SX30 yet, but in other Canon point and shoots there has always been a “Review” setting where you can choose to not show the picture you just took. Thanks, Zoobie, of course that’s an easy setting to fix (and it does work in the SX30).